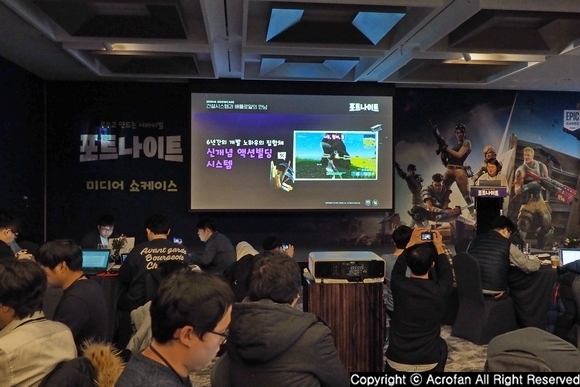 Epic Games Korea, the Korean subsidiary of Epic Games, held a media showcase at Grand Intercontinental Seoul Parnas in Gangnam-gu, Seoul on the morning of 19th January, 2018. The event was organized to introduce features and service schedule of Epic Games' action building game 'Fortnite' in advance of domestic service with some officials of Epic Games Korea including Country Manager Sung-chul Park, Won-se Lee, in charge of domestic business, and Hee-uk Yoon, in charge of marketing, in attendance. 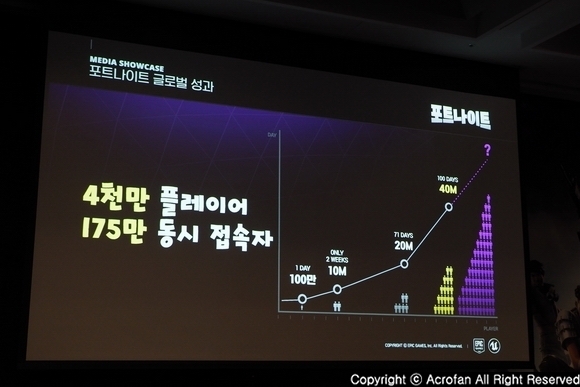 ▲ Epic Games Korea's "Fortnite" media showcase was held. According to the announcement, 'Fortnite' is an Action-Building game that combines elements of battle, construction and action. Its biggest advantage is that users can enjoy creative new concept of battle play with unique skins and emotions over a normal shooting game that users simply shoot down enemies. Especially by dissolving easy play and in-depth game elements into the game, it has been loved by gamers from all over the world right from its release. In July 2017, 'Fortnite' was released ‘Save the World’, a new concept of action building system that four players cooperate with each other through role division into battle and construction as an early access version through Epic Game’s platform ‘Epic Games Launcher’. In September 2017, ‘Fortnite Battle Royal’, a PvP mode separate from ‘Save the World’ was released free of charge. Epic Games has recorded 10 million users in two weeks after launching the 'Fortnite Battle Royal' mode, followed by 20 million users in 72 days, 40 million users in 100 days, and 1.75 million concurrent connected users (CCU). With more than 2 million CCU, it has been recorded as one of the fastest growing games. ▲ In 100 days, it recorded 40 million users and 1.75 million CCU. Regarding the service of 'Fortnite', Epic Games implemented a complete 'Global One Build' policy that simultaneously releases the same content all over the world. Also, it stated that it will never introduce a business model that would impair the game’s fairness such as 'Pay-to-Win' items. It made it clear that it will respond strongly to illegal users such as cheat program users. In addition, Epic Games will continue to provide fresh and new pleasure through fast content updates. 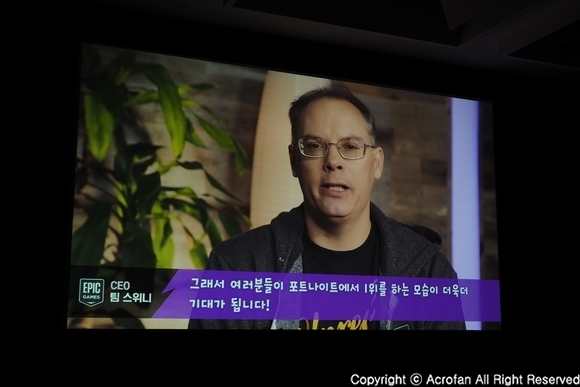 It will focus on high quality localization that is more readable than English version and has familiar fonts for Korean users to continue to develop the game. Epic Games has produced the first CF of 'Fortnite' in Korea, produced by Jung-hoon Park, a film director of the movie ‘The Villainess’, and Actor Sang-hoon Jung. It also plans to launch special events for domestic gamers such as releasing a limited edition T-shirt made by designer brand ‘Super Rocket Punch’, and providing Battle Pass to all the pre-orderers who play the game within two weeks after the launch. ▲ Various events for Korean users are prepared. 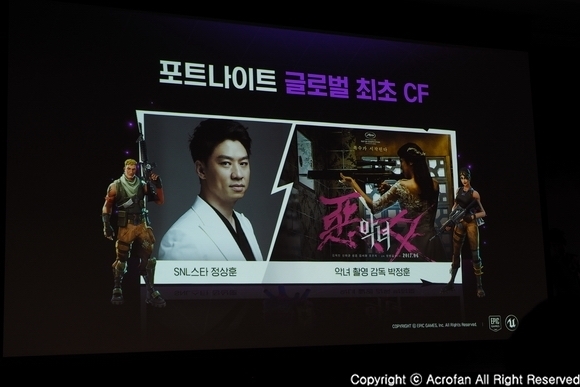 ▲ Epic Games has produced the first CF of 'Fortnite' in Korea, produced by Jung-hoon Park, a film director of the movie ‘The Villainess’, and Actor Sang-hoon Jung. 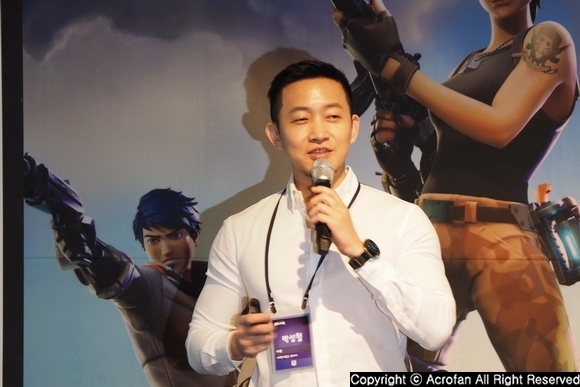 Sung-chul Park, Country Manager of Epic Games Korea, who came back on stage after the presentation of all the information about 'Fortnite', announced that Korea service of 'Fortnite' will start from January 23.